by Abraham J. Palmer, D.D. We sailed by steamer John Potter from the dock at Fort Hamilton (landing at Pier I, North River, New York City), through Staten Island Sound to South Amboy, N. J., and thence proceeded by rail to Philadelphia. Many will remember the greetings on the way: certain of companies D and H, whose homes were along the line of the railroad between South Amboy and Bordentown, in New Jersey, were met by their friends at the stations and loaded with gifts and refreshments: notably Tantum, when we reached his home at Windsor, and Captain Knowles, as we passed his father's farm at Yardville. 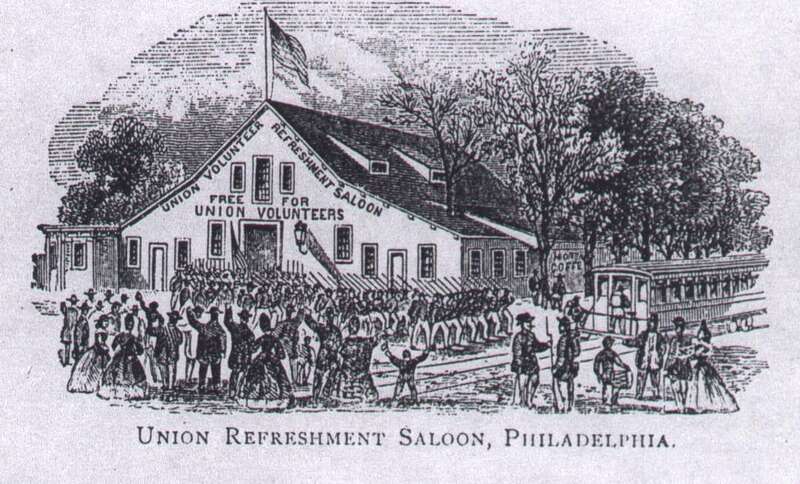 All will remember also the supper at Philadelphia, at the "Cooper Shop Refreshment Saloon." The noble City of Philadelphia gave a hearty meal to all the soldiers who passed through it, on their way to the front, and often it was the last "square meal" the boys were destined to have for years. We marched through Baltimore with loaded rifles, every man having received forty rounds of cartridge in case of emergency; but we were undisturbed; none greeted us with enthusiasm, but no one presumed to insult us. Colonel Perry was somewhat affronted by a pretend invitation to the regiment to dine, which proved a fiasco. We reached Washington at six P. M. on September 18th; next day we were assigned to temporary quarters in a brick building on Pennsylvania Avenue, not far from Willard's Hotel, and we received our rations at the Soldier's Retreat, but soon went into camp at Capitol Hill. We felt now that we were at the front. Here we caught our first glimpse of President Lincoln as he reviewed a regiment of cavalry which was in camp near us. In the company with Mrs. Hanley, the writer called at the White House; we sent up our cards, but we were not received. Possibly we had forgotten that we had ceased to be "citizens" and had become soldiers. "Privates" and regimental nurses were not expected to call upon the Chief Magistrate on passing through Washington. We learned the lesson of docility slowly, but we did learn it at last. From September 20th until October 15th we remained in our camp on Capitol Hill, spending our time at drill; here we were brigaded, and one day General T. W. Sherman, who was to be our commander, inspected out brigade. On October 5th we received orders to proceed to Annapolis, Md. We left Washington at twelve o'clock noon, and arrived at Annapolis at the same night at eleven o'clock. Application was made to the authorities at St. John's College for permission to quarter the regiment in college buildings that night, but it was refused; whereupon Colonel Perry intimated that "bayonets could pick locks." and we did sleep in the college buildings that night. Our rations not having arrived, we were invited by the Third New Hampshire to come to their quarters at the Naval Academy, and partake of coffee and hard-tack as their guests. Next day we went into camp in rear of the college buildings, our camp adjoining that of the Forty-seventh New York. From that day that brave regiment and ours became sworn allies, whose career in the war ran side by side for years, and between the two regiments a great friendship existed and many mutual courtesies were exchanged. On the 12th of October, Mrs. Viele, wife of our brigade commander, General Egbert L. Viele, presented the regiment with a stand of colors. An address of presentation was made by Governor Hicks of Maryland, to which Colonel Perry responded. The flag was destined to be shot into shreds at Fort Wagner. An amusing incident occurred at the first Sunday we were in Annapolis. The pastor of the Methodist Episcopal Church invited Colonel Perry to preach for him in the evening. There is a story told, at the expense of the ministerial members of the regiment, that the Colonel excused himself, saying, "You can call on Major Beard, or Captain Knowles, or Sergeant Irvine, or some of the enlisted men; but finally the Colonel did accept the invitation to preach. The congregation of the Methodist church in Annapolis were startled that night to see a tall and dignified minister ascend their pulpit, arrayed in full regimentals, with his sword at his side; he unbuckled his belt and laid his sword upon a pulpit chair as he knelt to pray. Many Southern sympathizers in the congregation left the church; those who remained heard a noble sermon from a noble preacher. It was his last appearance in a pulpit. The officers of the regiment received many courtesies while in Annapolis, especially from Judge Brewer and his family. We now learned that we were destined to partake in an expedition which was forming for an attack upon some unknown point on the Southern coast. On October the 18th we received orders to move, struck camp, and went on board the steamer Mayflower, which took us two or three miles down the river to the steamer Empire City, which lay at anchor in the stream. Our lives and our fortunes were now embarked on that ship, where we were assigned narrow quarters for days to come. Organization of the Expeditionary Corps, Commanded by Brigadier-General Thomas W. Sherman, U. S. Army, October 28, 1861. Eighth Maine, Colonel Lee Strickland. Third New Hampshire, Colonel Enoch Fellows. Forty-eighth New York, Colonel James H. Perry. Eighth Michigan, Colonel William M. Fenton. Fiftieth Pennsylvania, Colonel B. C. Christ. One Hundredth Pennsylvania, Colonel Daniel Leasure. Seventh Connecticut, Colonel Alfred H. Terry. Ninth Maine, Colonel Rishworth Rich. First New York Engineers, Colonel Edward Serrell. Third Rhode Island Artillery, Colonel Nathaniel W. Brown. The majority of the Forty-eighth Regiment remained on board the Empire City, although while at Hatfield, with thirty men of Company C, were transferred to the steamer Belvedere, and two companies, K and B, to the steamer Matanzas. It was not until October 29th that the expedition finally started; on that day a noble sight was to be seen in Hampton Roads, when, at the signal from the Wabash, the flagship of Captain Dupont, the great armada sailed away to sea. The Wabash led the way, and was followed by all the ships, moving in three parallel lines and occupying a space of some twelve miles each way; the transports and war-vessels were intermingled, so that in case of danger, the latter might act as convoys to the former. The transport vessels were the Atlantic, the Baltic (each carried a full regiment of men and large quantities of stores), the Vanderbilt, the Ocean Queen, the Ericsson, Empire City, Daniel Webster, and Great Republic (the latter vessel had been employed in a similar service by the British Government during the Crimean War). In addition to these were many smaller vessels, and indeed several mere river-boats, which were taken along on account of their light draught, and which were not fitted for an ocean voyage. The entire tonnage of the transports was estimated at forty thousand tons. The ships moved out to sea in three columns, in the following order: The Wabash, flanked by the gunboats Pawnee, Ottawa, Curlew, Isaac T. Smith, Seneca, Pembina, Unadilla, Penguin, and R. B. Forbes. The Baltic, towing the Ocean Express, led the column on the left, and was supported by the Pocahontas. The Illinois towed the Golden Eagle, and was followed by the Locus Point, Star of the South, Parkersburg, Belvidere, Alabama, Coatzacoalcas, Marion, Governor, and Mohican. The Atlantic led the central line, and was followed by the Winfield Scott, Potomac, Cahawba, Oriental Union, Vixen, and O. M. Petit. The Empire City led the right, followed by the Ericsson, Philadelphia, Ben De Ford, Florida, Roanoke, Mantanzas, Daniel Webster, Augusta, Mayflower, Peerless, Ariel, Mercury, Osceola, and two ferryboats. The twent-five coal barges convoyed by the Vandalia had been sent out the day before, with instructions to rendezvous off the Savannah River, so as to mislead the enemy as to our real expedition. The expedition sailed under sealed orders, of which every ship had a copy, and the instructions were not to break the seal unless the fleet should be dispersed in a storm. Great curiosity existed concerning our destination. Many of the men had never before been at sea, and the quarters of the private soldiers on the transports were cramped and poor, and what with sea-sickness, foul air, and filthy quarters, the discomforts were many. However, the voyage would have been short and less memorable had it not been for the great storm which broke upon us as we passed Cape Hatteras. The writer has twice crossed the ocean, and five times since then has passed Hatteras, but never has witnessed so terrible a storm at sea. It lasted for nearly a week. Four of the transports were lost, but it is a surprising fact that not more than a dozen persons perished. With so large a number of unseaworthy vessels in the fleet, it is wonderful that the casualties should have been so small, for the fury of the storm was terrible. The vessels lost were the Governor, Peerless, Osceola, and Union. The Governor foundered in Sunday, November 3rd. She had on board a battalion of marines, but they were saved by the frigate Sabine, excepting a corporal and three men, who were drowned. The Peerless was a small Lake steamer, loaded with beef cattle; her officers and crew were saved. The propeller Osceola, also loaded with beef cattle, was wrecked on North Island, and her crew were made prisoners. The Union went ashore at Beaufort, N. C.,, and her cargo was lost. Her crew and a few soldiers aboard were captured. The steamer Winfield Scott, which was subsequently wrecked while we were on board of her, barely escaped destruction in the storm. The Belvidere, with Lieutenant Dunbar and Hatfield and the detachment of Company C on board, was disabled, and put back to Fortress Monroe. The storm was grand as it was terrible, anada it scattered that noble fleet of vessels to the winds. It had often been compaared to the tempest which destroyed the Spanish Armada three centuries before. From the deck of the Mantanzas, on which the writer was, on the day before the storm the three long lines of war-ships and transports, that stretched as far away as the eye could see, were visible -- a noble and majestic sight. On the morning, when the storm subsided, from that same deck not a sail was in sight. Had they gone down in the sea? Were they scattered so far apart that no one of the ships was in sight of another? What had become of the weaker and less seaworthy vessels? It was a time of anxiety, as the storm itself had been to many a time of terror. The sealed orders were broken, and then for the first time we learned that our destination was Port Royal Harbor, on the coast of South Carolina. The fleet arrived off the bar at Port Royal, on November 4th; soundings were made, and the outer harbor was buoyed, and the next day the naval vessels moved over the bar, and drove back the mosquito fleet of Commodore Tatnall. The dangers of the sea were behind us, but we were now confronted by dangers on the land. The Confederates had erected two forts, one on either side of the entrance to Port Royal Harbor; the one on the north at Bay Point, Phillips Island, was named for Fort Beauregard; that on the south, on Hilton Head Island, Fort Walker. 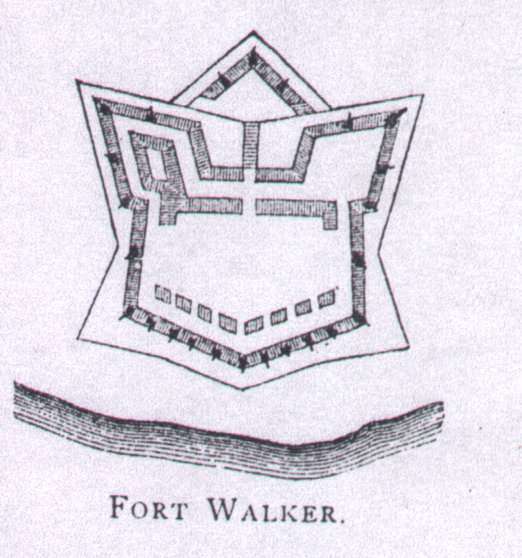 Fort Walker was a regular work, and mounted twenty guns. 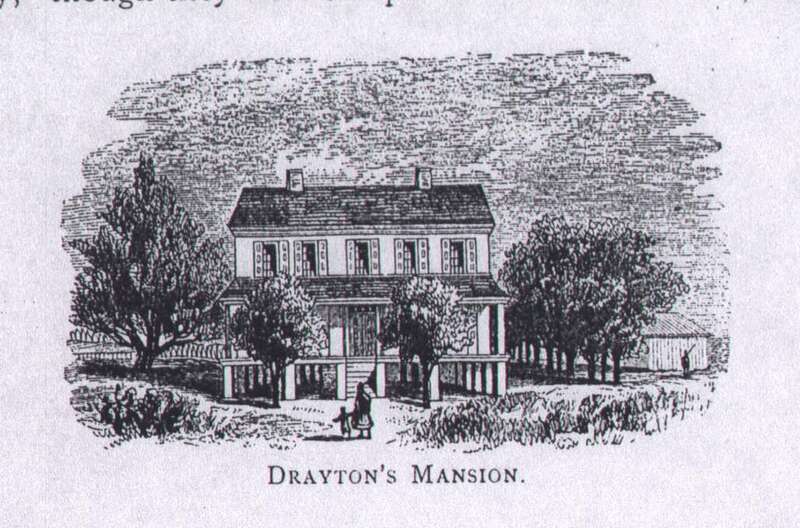 The forces at Fort Walker were commanded by General T. F. Drayton of the rebel army, whose mansion was neat by; his command numbered 1837 men. The garrison of Fort Beauregard was 640 men, under Colonel R. G. M. Dunevant. In addition to these forces on the land, the Confederates had a little squadron, already referred to, called the "mosquito fleet," commanded by Commodore Josiah Tatnall. At eight o'clock on the morning of November 7th the signal was given to the Union vessels to get under way, and at half-past nine the memorable naval battle commenced. The plan of attack was simple but unique. It was ordered that the ships pass up midway between Forts Walker and Beauregard (which were about two miles apart), receiving and returning the fire of both, sailing in an elipse. The Wabash led the way, next came the Susquehanna, then all the ships. This was the first battle in history in which a steam-navy had fought land battles while sailing in a circle, although the attack of Admiral Dundas in the harbor of Sebastopol seven years before was somewhat similar, Dupont's greatest credit for his work that day lies in the splendid victory, which he won with such little loss. The battle was a magnificent spectacle, as we witnessed it from the decks of the transports anchored off the bar. The ships kept sailing around in their circle, belching forth their fiery volleys, now at Fort Beauregard on the north, and now at Fort Walker on the south; and all we could do for our comrades of the navy was to cheer them from the transports throughout the day. At half-past eleven, the flag at Fort Walker was shot away; at quarter-past one the fort was abandoned. Fort Beauregard had also been silenced, and the garrisons of both had fled. The guns of the Federal navy had done fatal work, for the dead and dying were on every side, as if to fight their guns in the fortifications had been perilous to the enemy, the retreat was hardly less so. Of course it was precipitous, but the majority of both garrisons escaped. 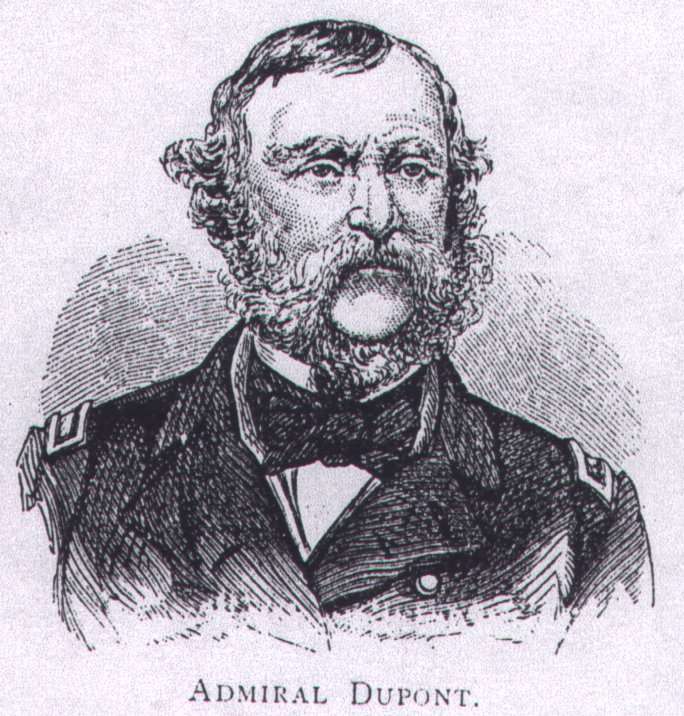 The loss on board the fleet was slight; Dupont reported his casualties at thirty-one, eight only being killed. The vessels engaged were, however, more or less injured by the Confederate guns. The Wabash, for instance, was struck thirty-four times. The fact that this was our first victory in the State of South Carolina gave it peculiar celebrity. That State had been the first to secede and the chief promoter of the Rebellion, and now the Federal forces had secured a footing upon its disloyal soil, loyal people everywhere were greatly rejoiced. The American navy covered itself with a lasting glory by it's achievements on that day. By the capture of Port Royal the Federal forces gained a magnificent naval depot and a firm foothold, from which she was never driven, in the region of the famous Sea Island cotton. It also became a sort of theatre for certain philanthropic experiments of antislavery advocates in those days. Beaufort District was perhaps the richest district in the whole Palmetto State. It contained fifteen hundred square miles of territory , and annually produced fifteen million pounds of rice and fourteen thousand bales of the finest cotton. It had a population of about forty thousand souls, more than three quarters of whom were slaves. The right wing of our regiment landed at Hilton Head Island on November 9th, and the left wing the next day. Transports everywhere were discharging troops, and the harbor presented a most animated appearance. We were marched about a half mile back from the shore, and went into camp in the midst of a cotton field. Scouting parties were sent out over the island, and they captured horses, mules, chickens, pigs and about everything they could lay their hands on, and divided the "eatables" between the different companies. That, however, was not considered "stealing," but "confiscating." From ten to twelve every morning we had battalion drill: from two to four every afternoon, company drill. Sometimes we were drilled by brigade. The work the boys loved the least was "fatigue duty," though they were compelled to do much of it, working on the fortifications which General Sherman foolishly persisted in erecting. Meanwhile all sorts of rude houses were hastily constructed in Hilton Head; an immense wharf was built; and vessels of all sorts, laden with all manner of supplies, came from the North, and in a short time quite a town had sprung up. Meanwhile the gun-boats had sailed up all the little rivers and taken possession of many islands. 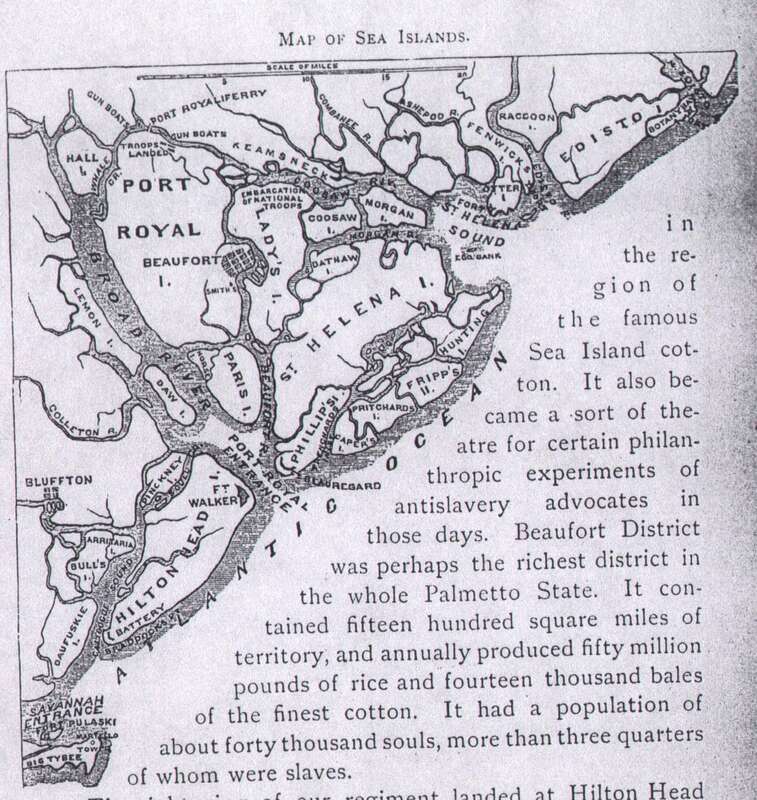 The aristocracy of Beaufort, on Port Royal Island, was occupied, only one white man being found in the place, everywhere the white people abandoned their homes and fled, and only the negroes remained behind; they thronged the camps in great numbers, often coming into camp, carrying in little bundles, all their worldly possessions, having a simple faith that when they reached "Massa Linkum's soldiers" they would be free. 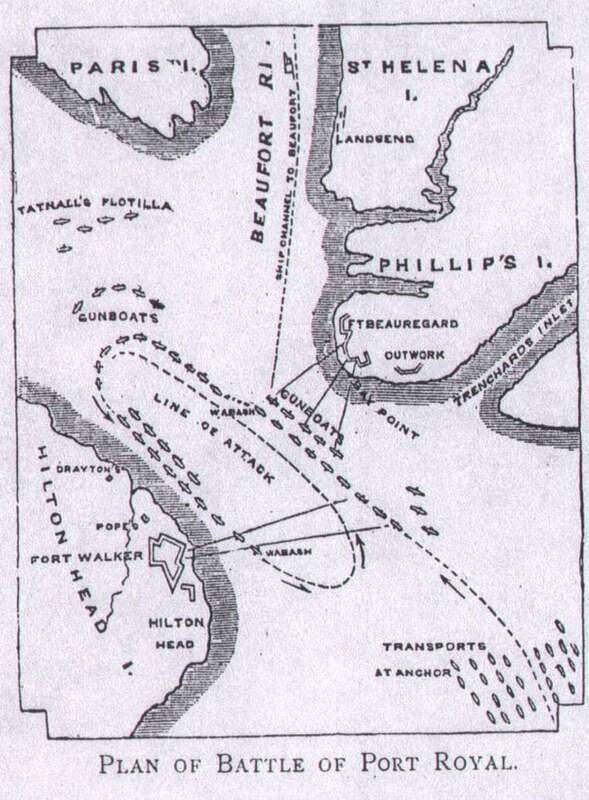 The panic which prevailed on these islands of South Carolina at our approach, and the precipitous flight of the enemy made many subsequently believe (as Colonel Perry believed at the time) that had we followed up on our victory at Port Royal by marching immediately against Charleston or Savannah, one of these cities might easily have been taken. On November 24th there was a general inspection and review by Generals Sherman and Viele, a well-known engineer, who had been prominent in the construction of Central Park in New York City, and who had recently been a Park Commissioner, and it is at this writing (1885) a member of Congress from New York. Let me here recall the names of the four ladies who had accompanied us from the North to act as nurses in the hospital. They were Mrs. Hanley, Mrs. Brooks, Miss Heward, and Miss Fox. Many of the boys who were sick in the hospitals will recall their kindness. Camp life at Hilton Head was now a monotonous routine; the climate also was unhealthy. We obtained water by sinking barrels in the sand. Yet our rations were good; we received our pay regularly; the sutler was handy, and on the whole we had a good time. Colonel Perry was a magnificent drill-master; the regiment's efficiency at drill soon became famous. But few changes up to this time had occurred among us. We received frequent mails from the North; also boxes which came to us by express from the good people at home. Who does not remember the pleasure he always found in reading his letters and opening his box when it arrived? One day there came into camp a contraband having two pups for sale. The writer purchased one for a quarter of a dollar; Arthur McGuigan, of Company D, the other one at the same price. The former dog drank a can of condensed milk (price fifty cents) the first day. His owner found him an expensive boarder, and disposed of him. McGuigan's dog was named "Jeff." and the company adopted him; and he became at last a hero , and died in battle, years afterwards, at Cold Harbor, being shot dead while barking up a tree at a rebel sharp-shooter. Every one will recall for himself many incidents of those first weeks in camp on the soil of South Carolina. The saddest memory will be that a number of the men who had had the measles on shipboard had taken cold from exposure during the storm, and died after reaching Hilton Head. But we were not unhappy in those days; here we came to know each other, and began to appreciate the temper of the men with whom we were associated, and with whom we were yet destined to stand shoulder to shoulder in front of fiery batteries and gleaming lines of steel. Thus came to an end the year 1861, and thus ends this chapter, with the regiment "at the front."